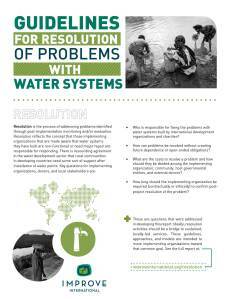 Today we are proud to launch the report on Guidelines for Resolution of Problems with Water Systems. This report addresses a widely ignored question in international development: what should be done when an implementing organization finds out (e.g., through post-implementation monitoring) that a water system they built is no longer providing services? Rehabilitation of infrastructure, the common response, if any, is not enough.